Home » Animals » Picture Books » Reviews » Reviews by Susan » Susan Whelan » Review: Time for Bed, Fred! Review: Time for Bed, Fred! Fred the dog doesn’t want to go to bed. As soon as he hears the clock strike eight and the word ‘bed’, he runs to hide in the garden. Eventually, Fred puts so much effort into avoiding going to bed that he wears himself out. A perfect picture book to read with young children who aren’t keen on bedtime, Time for Bed, Fred! has repeated phrases that make it particularly fun to read aloud and Fred's antics as he avoids bedtime will have children laughing as they cheer him on. 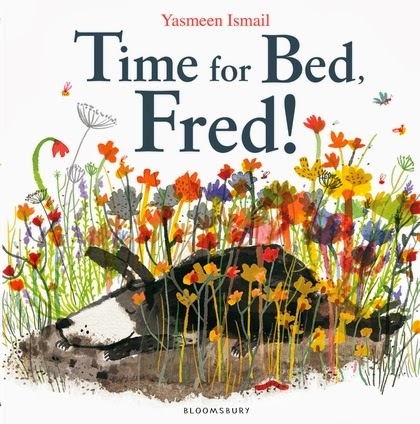 The illustrations by author/illustrator Yasmeen Ismail create a wonderful sense of movement in the early pages as Fred races about trying to avoid bedtime. They portray Fred as a large black and white dog that you just know would be perfect to cuddle up to, if only he would slow down enough and stop jumping in mud puddles! The busyness at the beginning of the story gradually slows as Fred gets tired and eventually falls asleep in his own bed. A lovely story for toddlers and preschoolers, Time for Bed, Fred! is sure to delight young children and hopefully help them, like Fred, settle down to a night of sweet dreams. Title: Time for Bed, Fred!